The most wanted ex-militant Leader in the Niger Delta region, Government Ekpemupolo (AKA Tompolo) yesterday sent a protest letter to President Muhammadu Buhari over an alleged plot by members of the ruling All Progressive Congress (APC) from Bayelsa and Delta States to frame him as the sponsor of bomb attacks against oil facilities in the region. 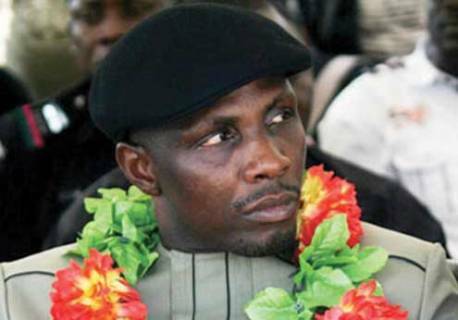 According to Tompolo, though he has repeatedly denied involvement in the alleged case of a N13 billion land deal fraud and the bombing of oil facilities leveled against him, the priming investigation by him showed that the desperate plot to hang him is being hatched by the Governorship candidate of the APC in Bayelsa State, Timipre Sylva, a lawyer attached to the Economic and Financial Crime Commission (EFCC), and one of his kinsmen within Delta State. ‎Tompolo, in the protest letter made available to newsmen yesterday in Yenagoa the State capital, alleged that the anger of Mr. Sylva and others involved in the plot are political and personal anger against his perceived influence in the region. “I want you [President Buhari] to beware that members of your Party in Bayelsa and Delta States. “I wish to inform you that, it has come to my knowledge that ,the leader of your party and governorship candidate of the APC in Bayelsa [Mr. Sylva] and a few young men from Warri South West LGA of Delta State, all of whom joined the party from the Peoples Democratic Party (PDP) after the 2015 presidential election, are hell bent on linking me to the renewed vandalization of oil facilities in the Niger Delta region. "They are doing this in connivance with the Economic and Financial Crime Commission, (EFCC) lawyer, who is also a member of your Party. The lawyer is at the forefront of prosecuting me because I refused to buy any property from him. The crux of this letter is to let you know that they are dubious, mischievous, desperate, pretentious, manipulative, and corrupt. Therefore, they do not share the same vision and mission with you, and they do not believe in good governance." "I will briefly tell you some of their antecedents in this letter.The leader of your Party in Bayelsa State approached me shortly after my meeting with you in Abuja,that I should accompany him to meet you and plead for him to be appointed as Special Adviser, SA and Chairman of the Presidential Amnesty programme committee, which I refused to do because of his antecedents, as not a reliable and trustworthy person." "It was thereafter he forced his way into the governorship election of the State, which almost tore the State apart with violence, beginning with the Party primary in which he demonstrated a high level of desperation as was recounted by the chairman of the committee and governor of Edo State, Adams Oshiomhole.